Editor's Note: The YouTube video that we posted here has disappeared. While the words on the page may not be as interesting as watching the video was, they describe how carpentry is changing. When the robot uses just positional data (fixed tool-orientation), it yields a 'poor result' due to 'limited rotational flexibility'. When the robot uses both positional and force data (active orientation) it achieves 'optimal blade/wood coupling'. 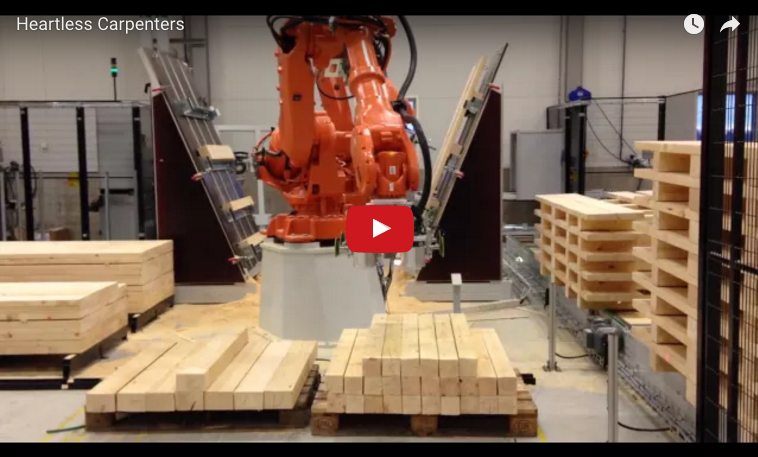 The robotic arm grabs a 2x2 from a pile, cuts it to length with a tablesaw-like tool, and places it into another pile. Next, it drills angled holes through the end of the 2x2s, and stacks them into a complex shape. Presumably fasteners slide through the holes, next. Auto workers were completely caught off guard when robots took their place, but carpenters always felt safe because robots can't work on jobsites. You get paid for what you do and what you know. If robots can do what you do, then is time to learn more.